Escape to the Andalusian Court and discover a magical oasis. Located in the stunning desert playground of Palm Springs, CA, our adults-only property features everything you could dream of for a memorable vacation - including luxury Villas with private garden patios, whirlpool jet spa tubs, and fully equipped kitchens. 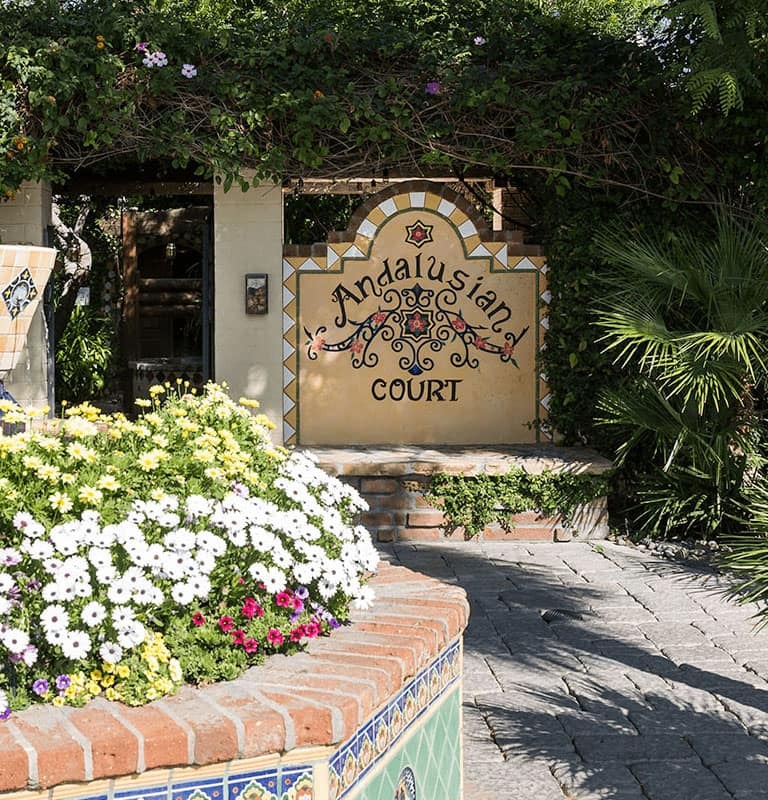 Whether you are looking for an eco-friendly hotel, pet-friendly options, free parking, or if you want to stay at one of the most romantic Palm Spring boutique hotels - the Andalusian Court is a dream come true. The Andalusian Court provides the perfect place to refresh and enjoy peaceful moments with those close to you. We provide pool floats for extra relaxation and our pool is heated for your enjoyment during your stay. As one of the few Palm Springs hotels to offer private garden patios with lush greenery and whirlpool jet spa tubs, our charming retreat provides quiet time for serenity, relaxation, reflection, and romance. Nestled at the foot of the magnificent San Jacinto Mountains, Palm Springs, California is a year-round vacation destination, offering more than palm tree-lined streets and stunning desert scenery. The city's chic restaurants, art galleries, trendy shops, and must-see attractions are within walking distance of the Andalusian Court - so you'll never be too far from the action! Take time to relax and enjoy genuine time together at our private hideaway in Palm Springs. With stunning grounds and amenities, a romance package, in-room massage services, and a grocery delivery service - everything is taken care of.